You’ve fallen in love, chosen your partner for life and set the date for your dream wedding – now that all remains is to decide on a stunning venue. If you live in or near London, then Warren House in Kingston-Upon-Thames is the perfect place to celebrate and share the day with friends and family. 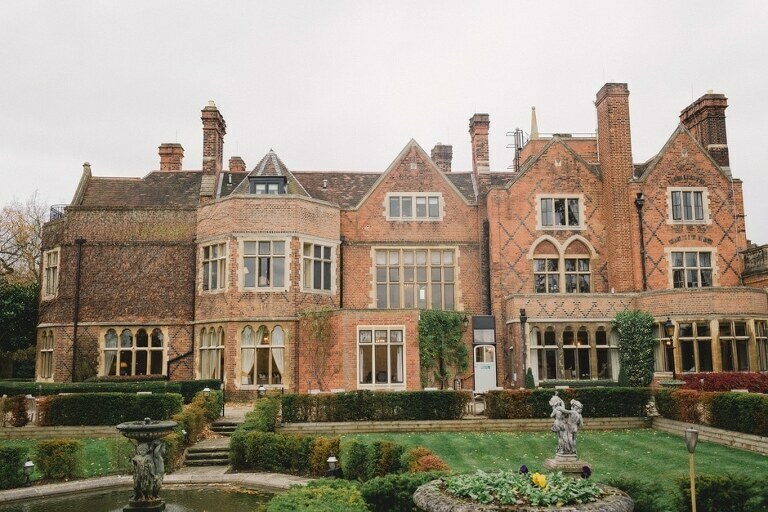 The impressive Victorian, Grade II listed mansion is nestled in four acres of tranquil landscaped gardens, and boasts nine elegant, light and airy interconnecting ground floor reception rooms overlooking the well-maintained gardens. Conveniently located, it is also within easy reach of Heathrow and Gatwick airports, the A3 and the M25. The venue is just a five minute walk from Richmond Park. Each room oozes timeless charm and elegance, whilst the stunning gardens of this magnificent hotel present many romantic backdrops for your beautiful wedding photographs, and guarantee lasting memories for years to come. The main house also contains three further dedicated lounges and dining spaces, as well as a spectacular outdoor Italian Terrace. And don’t forget the Grand Staircase. The Edwardian Ballroom is the perfect space to say your vows in front of 100 guests. Licensed for civil ceremonies, the grand room was modelled on the early 20th century Hall of Mirrors from the Palace of Versailles and is complete with original features and glittering chandeliers. Following the ceremony, there’s a choice of fantastic indoor and outdoor locations to toast your marriage, and then it’s onwards to the reception room to celebrate with your guests. The contemporary London Room has atmospheric lighting, a dance floor, and is a wonderful party space for evening entertainment. The Rose is an air-conditioned room with floor to ceiling windows on two sides and is located within the marble pillars of the former Italian Loggia, from where you and your guests can enjoy a truly superb view of the pond and Victorian ornamental gazebo. The Willow room benefits from lovely views onto the garden and the fountain. There are three versatile garden rooms with ornate paneling and fireplaces: Lavender, Lilac and Magnolia. Lavender connects with the Ballroom and can provide additional reception space if required. Magnolia is the largest of these three spaces. The Devey is a spacious Lounge Bar and the ideal space for a drinks reception, especially if dining afterwards in the adjoining Persian Dining Room. Named after the stunning blue tiles from Isfahan that surround the fireplace, the Persian Room is also the perfect location for your wedding breakfast. The Four Seasons Lounge was formally the Billiard Room, and has beautiful stone mullion windows and stained glass ceiling. Alternatively it can be used as an extension to the Persian Dining Room for larger parties. The beautiful Azalea Room overlooks the sunken Italian garden and ornate fountain. The refurbished Wisteria Lounge boasts a highly decorative fireplace and large stone mullion windows, and is both a lounge and dining space. I’ll certainly be spoilt for choice when choosing some amazing backdrops for your lovely wedding photographs at Warren House. Not quite in the right location? Looking for something a little smaller, more intimate? There are lots of beautiful wedding venues in Surrey that I’ve had the pleasure of photographing. You can find them here. Address: Warren Rd, Kingston upon Thames KT2 7HY. If you’d like to enquire about my availability for Warren House please get in touch here.